Kenya’s eastern Laikipia north of Mount Kenya boasts the highest diversity of large mammals in the country and is mostly known for its wilderness and wildlife. Lesser known is a small family run and award-winning safari outfit who’s speciality is mobile walking safaris with a team of Samburu guides and trackers using camels for support. Kerry Glen and James Christian operate from their ranch at Tumaren. Kerry’s of old Kenya stock who explored much of East Africa with her parents and brother whilst growing up. Her reputation as a Professional Guide was bolstered by her experience with the design, construction and management of the renowned Sabuk Lodge and a subsequent 8 year stretch of leading walking safaris in Laikipia. James is a biologist, photographer and birding specialist with a deep background in travel through Africa. Their team are the de facto experts at leading camel safaris in East Africa. These walking safaris are available on request through the year, essentially all tailor-made. Here’s a typical 3 day safari for a quick and easy break or the basis for an extended exploration. 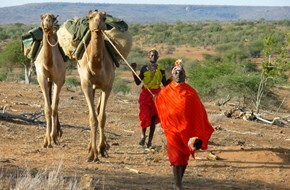 See the full itinerary to go walking with camels in the Laikipia.